Wipe down with wet cloth to clean, flat dry. Kakadu Soaka hats are easy to care for and are rated UPF50+ . Check out all of the different colors. Named for the town in Queensland Australia, this hat has both style and class. This canvas Aussie styled hat with ventilated mesh is perfect for keeping you cool this summer. The three strand band adds just the right touch and will make this Kakadu hat one of your favorites. Choose from the many different sizes and colors to match your wardrobe. Kakadu hats and Kakadu clothingitems in general make a nice gift for birthdays and anniversaries. They will not be disappointed. Coolongatta is also athe name of a leather hat from Kakadu Traders Australia. It is a sharp leather hat that provides a rugged vintage look that is remarkably supple to touch. The vintage leather has been enhanced by a special treatment designed to mimic the unique worn appearance of traditional leathers. Each leather hat Kakadu Traders Australianmakes is unique. It’s character enhanced by the subtle variations and scratching that occurs naturally on genuine leather. The Full grain leather is specially treated to create a rich dull luster that will be smooth and comfortable for years. Stay tuned there are NEW Kakadu hat styles being introduced by Kakadu Traders. I will post these to this blog as soon as the pictures are available. That’s the meaning of the word Echuca. Named for the town in Victoria, Australia this leather hat is sure to please. It’s Australian made textured leather designed by the folks at Kakadu Traders Australia. Available in black or brown with a braided leather band. Don’t get caught out in the rain without your Kakadu Echuca leather hat. Find this hat and many other fine outdoor clothingitems at Lorsey.com. Why wouldn’t they? They love the leather look and the warmth of the faux rabbit fur. If you spend much time in the cold you how important it is to keep your head warm. The Kakadu Inlander hat will keep your head warm and you will look good wearing it too. If you do’t want the leather and prefer the canvas than you could option for the Kakadu Huskie hat instead. At Lorsey.com we carry the entire line of Kakadu hats, shirts, bags and jackets. “And I ain’t one to complain, but what a perfect waste of wine it seems to be.” Ah yes the lyrics to the Jim Stafford classic. At Kakadu Traders Australia they’re singing about the quality leather hats they produce including the Kakadu Bulldog Hat. The Kakadu Bulldog Hat is made with the distressed leather and comes with a shapeable brim. Get your Bulldog on with Kakadu clothing! Certainly one of the signature hats available from the Whillas brothers. 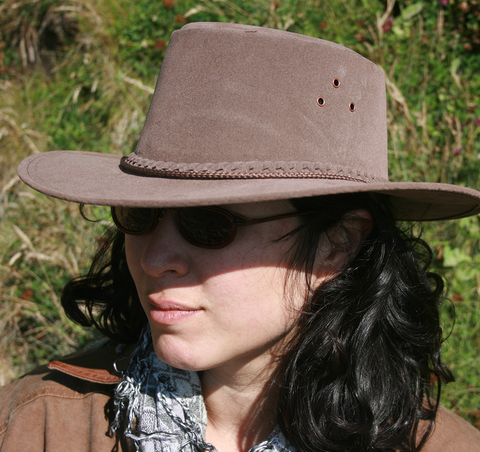 This Mossback suede hat is foldable, waterproof, lightweight and looks great. I love the kangaroo metal logo attached to the three strand braided band. this hat is known as the “unique Australian bush hat”. The Kakadu Alice hat and other Kakadu hats are available at Lorsey.com. Determining your hat size s easy, just use a measuring tape and place it around the circumference of your head, slightly above your ears. Hat sizes may vary slightly depending on the fabrication. Hats made from thicker leathers usually run smaller and hats made from thinner leathers tend to run smaller. At Lorsey.com we offer the complete line of Kakadu Traders Aussie inspired hat collection. Kakadu hats will make a great addition to your wardrobe. Why not give a nice looking suede hat from Kakadu Traders Australia. I love the look of the Kakadu Northern Territory Soaka hat. It’s got a wide brim and a western style all its own. You’ll love the corded leather band and your friends will love the way it looks. At Lorsey.com we carry the entire line of Kakadu clothing including hats, bags, shirts, vests and jackets.